Last year a good friend and fabulous knitter passed away. Shortly afterwards some of the knitting buddies were asked if we'd help to sort out her knitting room. We were sad, but happy to be of help. A knitting project, still on the needles was this fair isle project, likely a design by Alice Starmore, as some of our group had participated in a Starmore knitalong. We didn't know what to do with this beautiful piece of knitting and we didn't want to throw it out. I had traveled to Shetland in September 2015 with another friend, P., and had learned about Burra Bears. 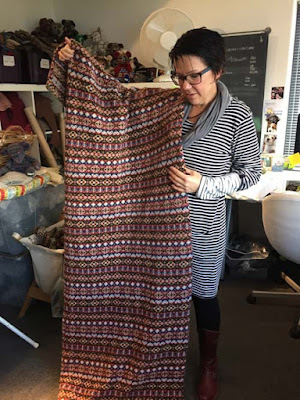 Wendy Inkster, the owner of the Burra Bears Studio, takes knitted pieces and repurposes them. Some are old, loved, sweaters that are no longer worn, for example. P. suggested that we contact Wendy to see if there was enough fabric to create a bear. Fortunately, there was enough for a small one. The knitted piece was mailed off to Wendy with the promise that we'd pick it up when we traveled back to Shetland for Wool Week in September, 2016. The drive from Lerwick to Burra is beautiful and we had the added anticipation of seeing how the little bear turned out. 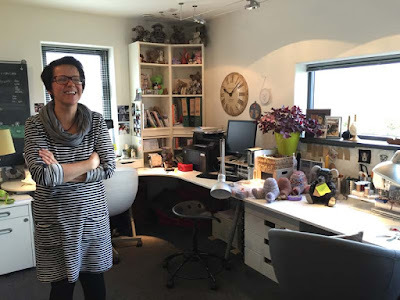 We were warmly greeted by Wendy and she showed us her workroom. It's a gorgeous location, attached to her house, where she can look out at the water and fields through the window. Aside from the custom orders, Wendy finds old sweaters in charity shops and also has some lengths of fairisle fabric knitted up. The one, below, is in traditional Shetland colors and patterns. 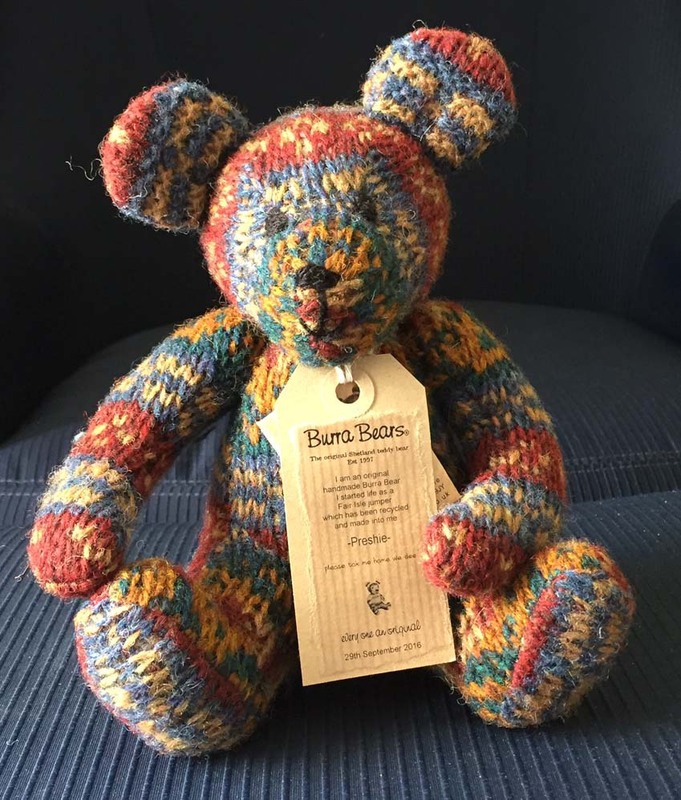 Burra Bears can be found in some of the shops in Shetland, and I saw one in the gift shop on the ferry from Aberdeen to Lerwick. When we saw the bear, it was love at first sight. Wendy had done such a wonderful job with the bit of knitting that we'd sent. The little bear was so cute! We were asked if we'd like to give the bear a name. Our friend had an expression when she saw one of our projects and she particularly liked it. She would say, "Isn't that preshie" (precious)! So, the bear now has a name, Preshie. 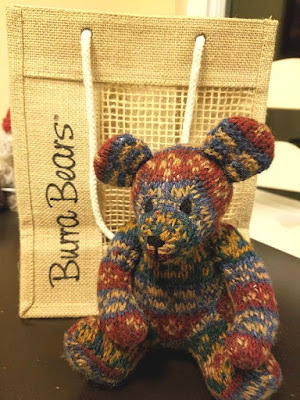 A month later, Preshie was in her little carry bag (with a mesh front so that she could breathe) and the knitters met our friend's hubby for dinner and we gave the bear to him as a remembrance. He loved it. If you have a wool sweater and you want to preserve it for whatever reason, or if you just want a Burra Bear, I suggest that you contact Burra Bears. I can't say enough good things about Wendy and her company.